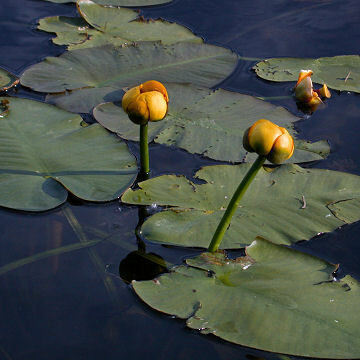 Spatterdock (Nuphar advena) is also known as Cowlily, Yellow Pond Lily, Yellow Water Lily, and Swamp Doc. It grows profusely in the wetlands of the upper Wolf River, rooted in the bottom sediments with large leaves floating on the water surface and attractive yellow flowers on erect stems. Spatterdock and other aquatic plants provide important habitat for other aquatic organisms small and large. The seeds are consumed by waterfowl, deer, raccoons and other species, while the tuberous roots are food for beavers and muskrats.